2 socks on 2 circs, Addi US 1.5 (2.5mm), 24"
If you look super closely, you can see the k tbl twist at the heel flap... Actually, when picking up gusset stitches, I always pick the back loop up with a seperate needle and knit that thru tbl-- so on the next round, I knit the subsequent stitch tbl as the pattern calls for. Other than that and knitting them on 2 circular needles, I followed the pattern exactly. I knit the smaller size, and knitting them on 2 circulars gives you a chance to fit the sizing as you go(the sizing only differs in how many decreases are made). I have a 8.25" foot circumference at the widest part of my foot. An aside, I measured the finished socks weight and used 98 grams of yarn total (with my size 9-9.5 women's feet)-- so you could knit this pattern with 2 skeins of Koigu (same base yarn as the cherry tree hill), if you're brave enough to cut it that close :) Shortening the length of the leg is also a possibility, but lately I've been drawn to longer leg socks myself. I like the long heel... I don't know why, but I like the length of a "long" (3") heel over a short one. I usually wear my socks in high top Cons, so its not an aesthetic big deal to have a long heel poking out the back of low slung shoes, at least for me. It also *feels* good, the double thick fabric reaching from the actual top of the heel all the way to the floor. You are right, the green really does suit the pattern. Great socks, they look lovely. oh, they are fab!! the color is perfect with the pattern, and great shots of the details. I have been shying away from sock lace fearing it will "bother" the foot when in the shoe. ??? Very nice! 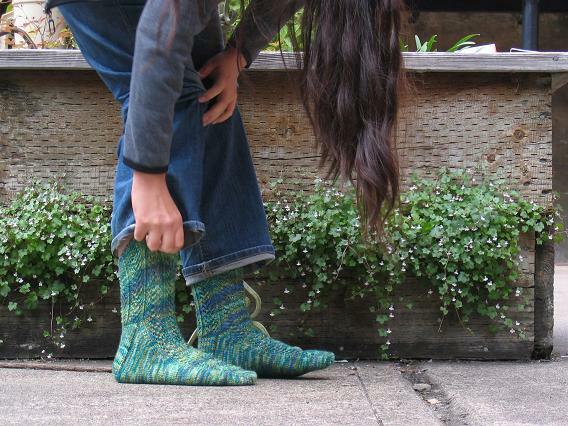 I'm bidding on some bright green hand-dyed merino on eBay and have Hedera in mind for it! I was hoping to finish my Yukon Leaves today, but I got side-tracked a lot, so it may be tomorrow. 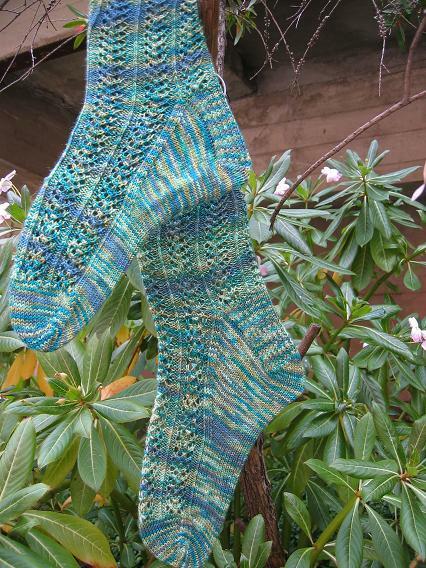 I want to try some Lorna's Laces and Jaywalkers next, but I may knit some Father's Day socks first, so I don't run out of time! 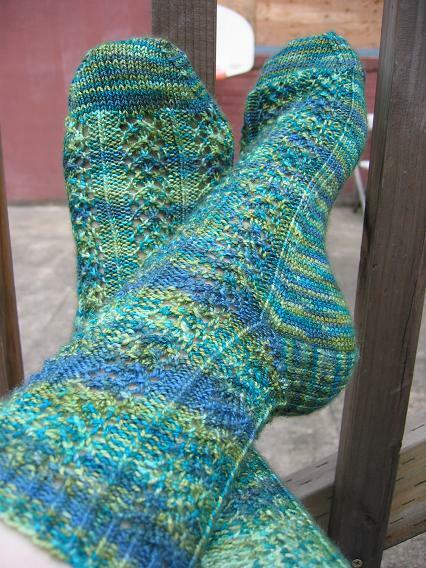 I, too, am becoming a lover of lacey socks! Those Hederas are gorgeous. 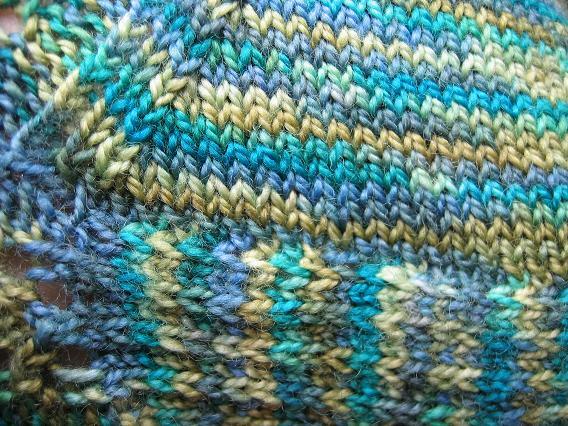 It's nice to see the pattern hold its own against the variegated yarn. Quite often there's more competition and the pattern gets lost. The colour is lovely. So cool, I can't wait to make a pair! They look great! I have some of that Mill-End CTH but I haven't finished untangling it yet. For a second there I was genuinely baffled as to why you were sockless, pantless, not standing up straight, and why you had only 10 seconds or less, but then I read the comment above the picture and realized you were talking about the socks. D'oh! That will teach me to skim posts. They look great, as usual, and I love the sock in action picture. I swear I don't work for the company:)It's just it works great to dry things in cramped quarters or where you need to keep them off the floor away from furry kittens (or less furry children). Love the Hedera's - I have a skein of CTH destined for them. If you ever want to split a mill end of CTH, I'll be happy to! They are so big I've never bought/bid on one knowing I'd have to knit a bunch of socks in the same color! awesome socks! Love the color. I keep thinking about that pattern, but just haven't gotten around to trying it yet. 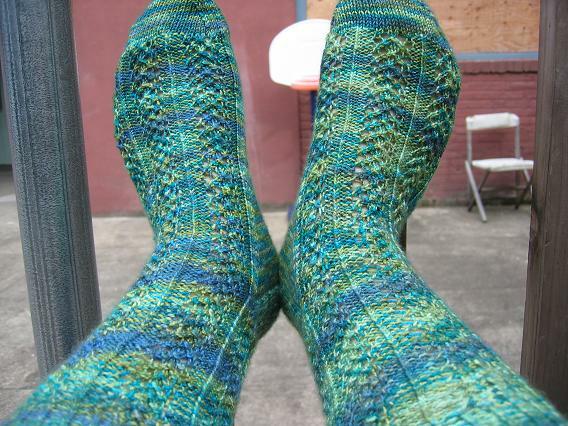 The socks look great; I have always been into a bit of a longer sock myself - glad to hear of others in the same fold. 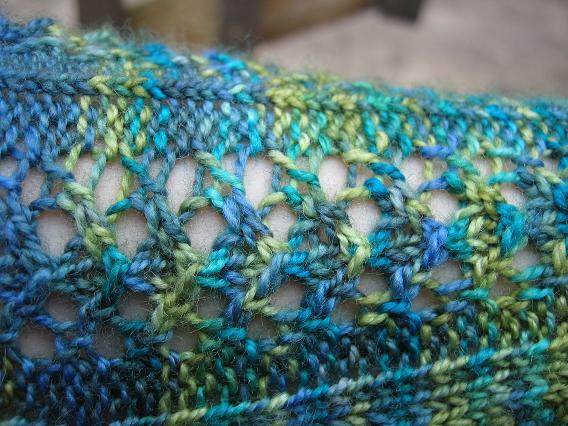 The yarn does not overwhelm the pattern which is great and I think so easy to do with Lace anything. Good job! Nice job on them! They look good! I love that pattern, nice shots of the lacework. The colors look really pretty with the pattern. And I like the action shot too (but that 10sec timer is hard to work with sometimes). Those Hederas look lovely! You've moved them up my list. :) second (or 5th or whatever) everyone who's said that the yarn and the pattern really complement each other. Beautiful.